I finally did an about me post instead of the generic about me form. My post is about the movie Burlesque starring Cher and Christina Aguilera. My post this week is a yummy recipe and a giveaway! A new artisan business in our area! 8. Wade on Birmingham - The continuing adventures of Krista Klumpp of Fairhope on "Survivor." 9. Birmingham Blogging Academy - A first look at the my new organization, the Alabama Social Media Association, which you may have ready about on Alabama Bloggers. My post this week touches on some of tasks I was able to accomplish on Thursday and Friday - Mardi gras parade, thrifting, crafting, etc. I posted a photo of the Southern Belle Dash, two Pilgrimage Junior Hostesses who ran across the lawn of Sturdivant Hall following a photo shoot. While I love the action and scenery in the picture, I really like what one of the girls is wearing on her feet! Do you wonder where missing socks go? Well, I finally figured it out, and the results of my investigation are shared this week at The 3R Ranch. 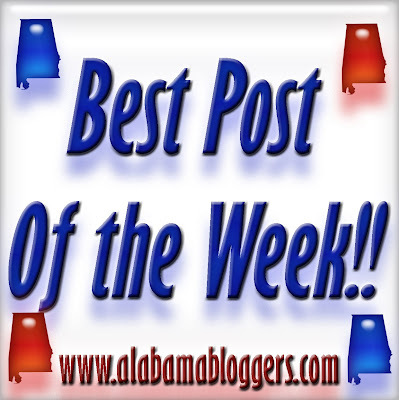 This week's posts and pictures feature camping in Alabama, as well as Spring parties, recipes, date ideas and Blog Linkage.